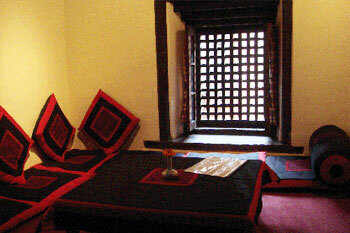 The "Newa Chen" is a well-preserved example of a traditional Newari house in the Kathmandu Valley. Ideally located at Kulimha tole, North of Patan Durbar Square, the property is built of brick and timber in traditional Malla style with three wings around a central courtyard. The open plan public rooms overlook the central courtyard and the suite of bedrooms, decorated with beautifully carved windows, furnitures and local artifacts. As you can see the beauty of this house lies in its detailed and hard effort put forwarded by artisans of those old days with love, passion and devotion. This house represents the Golden era of Malla dynasty – the era of flourishing art and culture (reminiscent of Renaissance in the West). Lot of people who love and believe in heritage has contributed great effort in the preservation work of this house. We are very thankful to them. This house now stands as a symbol of pride to all heritage lovers. Therefore, this house not only belongs to the “Shrestha family” but also to all “Heritage lovers”.